Heroin addiction exacts a terrible toll. For many addicts the condition lasts a lifetimea lifetime shortened by health and social consequences of addiction. NIDA-supported researchers at the University of California, Los Angeles (UCLA), examined the patterns and consequences of heroin addiction over 33 years in nearly 600 heroin-addicted criminal offenders and found that their lives were characterized by repeated cycles of drug abuse and abstinence, along with increased risk of crime or incarceration, health problems, and death. Drs. Yih-Ing Hser, Valerie Hoffman, Christine Grella, and Douglas Anglin of UCLAs Drug Abuse Research Center studied a group of 581 male heroin addicts admitted between 1962 and 1964 to the California Civil Addict Program (CAP), a compulsory drug treatment program for criminal offenders. By 1997, nearly half of the group had died, roughly 40 percent of those still living reported using heroin within the past year, and fewer than 10 percent of the survivors were currently enrolled in methadone treatment. Researchers first interviewed the participants during the period 1962 through 1964 and conducted followup interviews at roughly 10-year intervalsin 1974 and 1975, 1985 and 1986, and 1996 and 1997. In the most recent interviews, the UCLA researchers found that 284 (49 percent) of the 581 addicts enrolled in CAP between 1962 and 1964 had died. The most common cause of death (21.6 percent) was accidental poisoning or drug overdose. Homicide, suicide, or accident accounted for 19.5 percent of deaths, and the next most common causes were liver disease, cancer, and cardiovascular diseases (15.2, 11.7, and 11.7 percent, respectively). Fifty-five original participants could not be located, refused to be interviewed, or could not be interviewed. 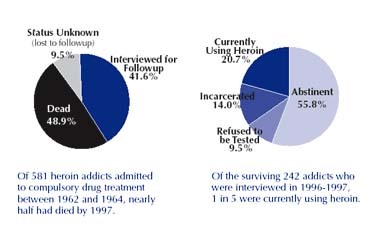 Of the 242 surviving members interviewed in 1996 and 1997, 135 (55.8 percent) were not currently using heroin, 50 (20.7 percent) were actively using heroin, and 23 (9.5 percent) refused to provide urine samples for testing. In addition, urine samples were not available from 34 men who were incarcerated at the time of the interviews. During any given year, roughly 10 percent of participants were in treatment, according to Dr. Hser. Although many of the survivors reported that they had been able to stop using heroin for extensive periods, fewer than half reported abstinence for periods of more than 5 years, Dr. Hser says. Abstinence for 5 years significantly reduced the likelihood of relapse, but even among those who achieved 15 years of abstinence, a quarter still relapsed. Those who achieved abstinence for more than 5 years were more likely to be employed and less likely to report that they had health problems that prevented them from working, were receiving public assistance, or had been involved in criminal activity than were the rest of the cohort. Rates of HIV, hepatitis, and sexually transmitted diseases did not differ very much between those who had achieved more or less than 5 years of abstinence. Heroin addicts and treatment providers should understand that treatment is a way to achieve abstinence and that recovery consists of improvements resulting from those periods when they are free of addiction, Dr. Hser says.  Hser, Y-I. ; Hoffman, V.; Grella, C.E. ; and Anglin, M.D. A 33-year follow-up of narcotics addicts. Archives of General Psychiatry 58(5):503-508, 2001. Although the current epidemic of cocaine use has commanded more attention, heroin use remains a serious problem in the United States. For example, the number of hospital emergency department visits related to the use of heroin rose from 38,100 in 1988 to 63,000 in 1993, an increase of 65 percent. In addition, some researchers have noted that snorting and smoking heroin may be growing in popularity as alternatives to injecting the drug. In a recent study, NIDA researchers confirmed that the addictive effects of heroin can be obtained by smoking the drug, although smoking is a less efficient route of administration than injecting. The findings might help explain anecdotal reports of heroin smoking among users in some large cities in the United States. In the study, scientists in NIDA's Division of Intramural Research (DIR) at the Addiction Research Center in Baltimore gave heroin to human volunteers via a computer-controlled smoking device that delivered precise doses of the drug. The effects of four separate doses of smoked heroin were compared to those produced by four intravenous doses of heroin. "The effects were similar but not equal on a gram-to-gram basis," says Dr. Edward Cone, who headed the study. By either route, heroin was detected in the subjects' blood within 1 to 2 minutes of administration. For similar doses of the drug, however, smoking produced lower levels of heroin in the blood. The onset of heroin-induced miosis, the constriction of the pupils, took as long when the drug was injected as when it was smoked. By either route, low and moderate doses of heroin produced miosis within 5 to 15 minutes; for high doses, smoking and injecting both caused miosis within 2 minutes. After similar periods, the subjects also reported that by either route they could "feel" the drug and perceive its pleasurable effects. Dr. Cone says the findings suggest that people who smoke heroin may do so because the pharmacological effects are similar to those they obtain by injecting the drug. Although reliable epidemiological data on heroin smoking are not available, says Dr. Cone, some researchers believe that the practice may be growing in popularity among heroin users, due in part to a fear of HIV infection. Needle sharing, a common practice among injecting drug users, accounts for many cases of HIV infection. Smoking heroin also may make it easier for some people to start using the drug, particularly those who have been deterred by the prospect of injecting themselves with needles. "Many people just hate the idea of needles," says Dr. Wayne Wiebel, a NIDA-funded researcher at the University of Illinois in Chicago. Dr. Wiebel notes that there have been sporadic reports of smoking among heroin users in Chicago and other large cities in recent years. However, he says, heroin smoking does not appear to be on the verge of becoming widespread. to reported increases in hospital emergency department visits. "It is certainly not a trend, and it is not showing up in a major way," Dr. Wiebel says. Rather, the main shift seems to be a decline in the proportion of users who are injecting heroin and an increase in those who are snorting or inhaling it. This shift, he says, may be contributing to increases in anecdotal reports of first-time heroin use among teenagers and young adults in U.S. inner cities. He adds that the increasing use of heroin among this age group eventually might supplant the cocaine epidemic in those areas. 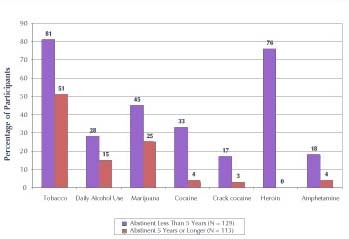 Nationwide household and school drug use surveys have not documented the shift in usage patterns or the increase in heroin use among young people that Dr. Wiebel and other drug abuse professionals have observed. Heroin statistics are difficult to obtain from these instruments because heroin use involves less than 1 percent of the population and many heroin users are not part of a traditional household. Although officials caution that estimates of drug-related hospital emergency visits could increase or decrease over time for reasons unrelated to the size of the drug-using population, these estimates at least hint of a change in heroin use in recent years. Between 1992 and 1993, heroin-related hospital emergency department visits increased by 35 percent, from 5,900 to 7,900 among people ages 18 to 25, according to the Drug Abuse Warning Network (DAWN), a national survey conducted by the Substance Abuse and Mental Health Services Administration (SAMHSA). During the same period, cocaine-related hospital emergencies changed little among this age group. The DAWN survey also found that, between 1988 and 1993, the number of hospital emergency department visits related to snorting or sniffing heroin jumped by 470 percent, from 1,100 to 6,000. SAMHSA officials point out, however, that despite this increase, hospital emergencies related to snorting composed just 20 percent of the increase in heroin-related emergencies over this period and still constitute less than 10 percent of the total number of heroin-related hospital emergencies. Regardless of how users take the drug, an increase in the purity of heroin could be one reason for the increase in hospital emergency department visits. According to a report by the U.S. Drug Enforcement Administration, the purity of an ounce of heroin purchased on the street rose from 34 percent in 1990 to 66 percent in 1993. The greater purity of heroin could result in more overdoses and, in turn, more hospital visits. Both Dr. Wiebel and Dr. Cone say they believe that the increasing purity of heroin also is probably one factor that accounts for the reports of higher rates of snorting and smoking heroin. High-purity heroin makes getting high easier for people who use these less efficient routes of administration. Jenkins, A.J. ; Keenan, R.M. ; Henningfield, J.E. ; and Cone, E.J. Pharmacokinetics and pharmacodynamics of smoked heroin. Journal of Analytical Toxicology 18:317-330, 1994.